December 3rd 2015 marked the official release of PHP 7, the new version of the popular programming language. 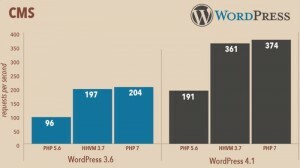 The latest PHP version released was PHP 5 in 2004, more than 11 years ago. For this reason developers’ expectations are very high for this new version. In this article I will talk about the main improvements of PHP 7. To start, I’ll explain what happened with PHP 6. When PHP developers began planning for the version 6, they defined that a great improvement would be to implement full Unicode support in PHP strings. What happened was that this change brought so much trouble to the rest of PHP that developers decided to abandon the version 6 altogether. As there were already articles, books and groups that have used the version number 6, the final decision was to skip this version and go directly to version 7. The PHP version 5 had several updates since it was launched back in 2004, the last one was version 5.6. In the meantime Facebook has been working in parallel, creating the PHP HipHop Compiler in 2010, then included it the HHVM (virtual machine to run compiled applications). In 2014 the Facebook released the programming languageHack, PHP-based and which can also be executed through HHVM. These initiatives were all parallel to the development of PHP, but assisted in the general direction of the language. In this context the creation of the PHPNG (PHP Next Generation) was initiated, a Zend Engine refactoring. When the new engine was finished a great performance gain was achieved, so PHPNG became the basis for PHP 7. Next, an explanation of the major improvements of PHP 7 when compared to previous versions. The most important improvement (and I’m sure most commented) is performance. According to the official website, PHP 7 is twice faster than the PHP 5.6. A considerable improvement. This was possible because PHPNG optimizes memory usage and adds just-in-time compilation (JIT). Below some graphics prepared by Zend performance team (to see the entire infographic, click here). Two new operators were introduced in PHP 7. The null coalesce operator allows you to check if a variable or array key exists and assign a default value if it does not exist. This was usually done with isset(), now you don’t have to. Fatal error: Uncaught TypeError: Argument passed to add() 2 must be of the type integer, string given. The only exception is when you assign an int to a float variable. As an int is a float rounded, it is possible to make the conversion from int to float without losses, so there is no mistake in this case. As well as in type declarations, it is now possible to define return types of functions and methods. One of the best new features in my opinion is the conversion of several fatal errors in exceptions. This means that errors that would disrupt the execution in PHP 5+ can now be treated with a try/catch block. This gives a better error handling within classes this decreasing those PHP error screens. This improvement comes with the creation of /EngineException, which can be used to handle the errors. Some things have been removed and will no longer work in PHP 7. These items were already considered deprecated, so no one should be using. But there’s definitely a lot of code using this around, so a lot of people are going to have headaches when upgrading. ASP-style tags (<%, <%= and %>), were removed as well as script type tags (<script language=”php”>). The recommended tag remains <?php. Some functions were also removed, for example split. Among these functions are all ereg functions (ereg_*). Now should use preg_*. Another extension that was abandoned was mysql and its mysql_* functions. But don’t worry, you can still access the MySQL database using the mysqli extension and the mysqli_* functions. In fact, you should already be using them – if you’re not, you can start to replace. From now on only _construct() will be allowed. It will still be possible to use them, but you’ll get an E_DEPRECATED notice. 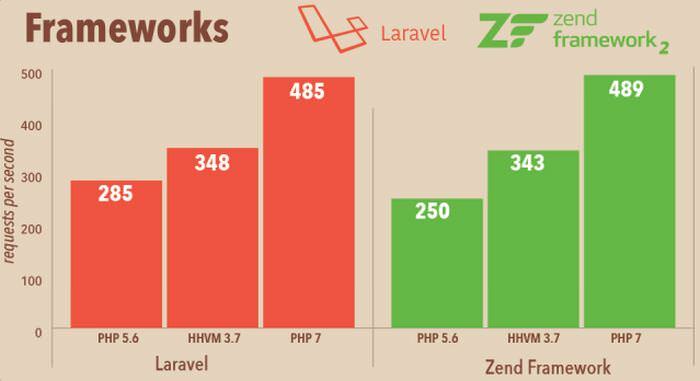 These are some of the improvements of PHP 7 most talked about. We hope that with the refactoring that has been made more improvements will arrive with the next smaller versions making PHP even better. 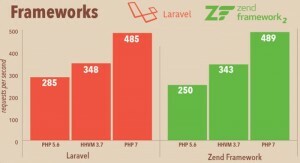 Have your started using PHP 7 already? What improvements did you like more?